Sunday, September 18, 4:00 – 7:00 P.M. In her most recent and on-going body of work, Emily Hermant utilizes slow, hand-making processes to generate modes of representing the rapid movement and proliferation of digital information and communication in contemporary life. Among her aims is to address the tension between digital/virtual technologies and our desire for the intimacies and richness of tactile, slow experiences. 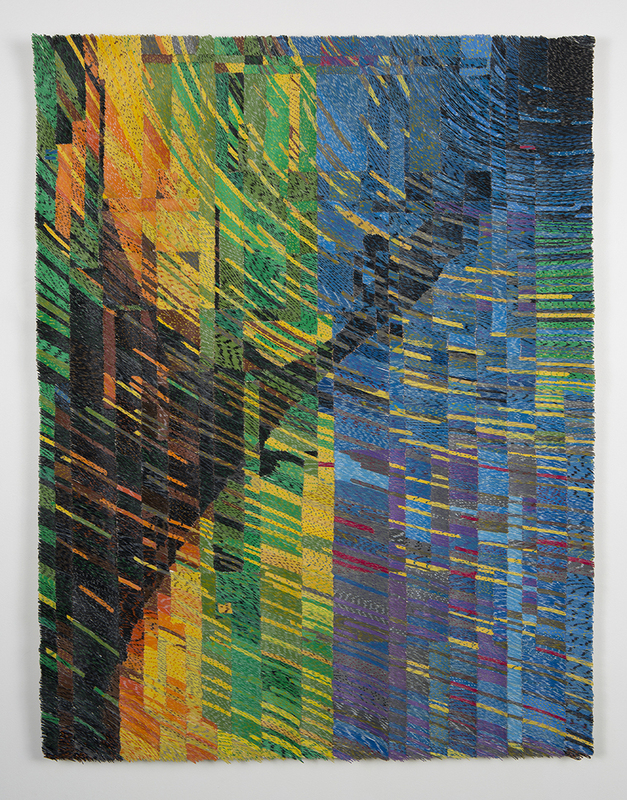 Through recent sculptural works, installations, drawings, and prints, Hermant’s formal focus is to explore relationships among color, line, movement, space, and perception vis-à-vis the speed and motion of digital information. 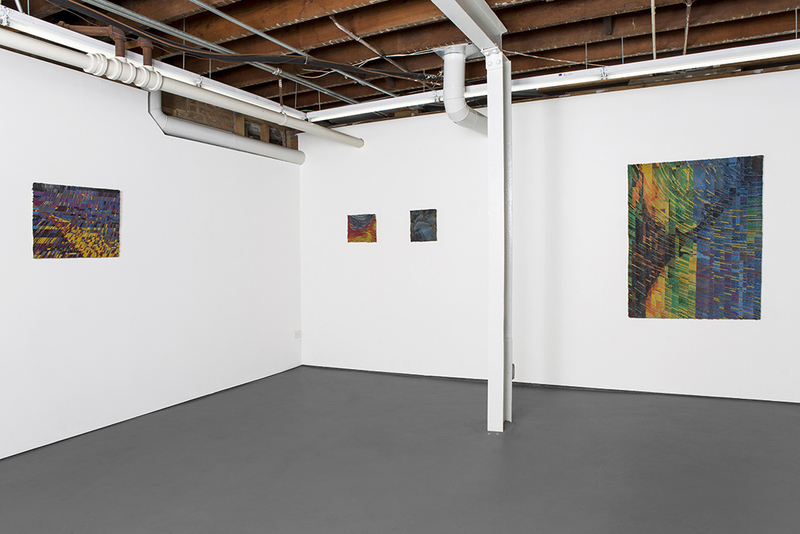 For her exhibition “Searching the starry sky” at 4th Ward Project Space, Hermant presents a series of hand-rendered material drawings based on collected, layered images of meteor showers and night skies which have been infused with random glitches and unexpected spasms. The pieces in this exhibition are constructed from accumulated and stripped telecommunications and data cables culled from e-waste recycling centers—“useless” materials once tasked with carrying invisible information across vast distances. 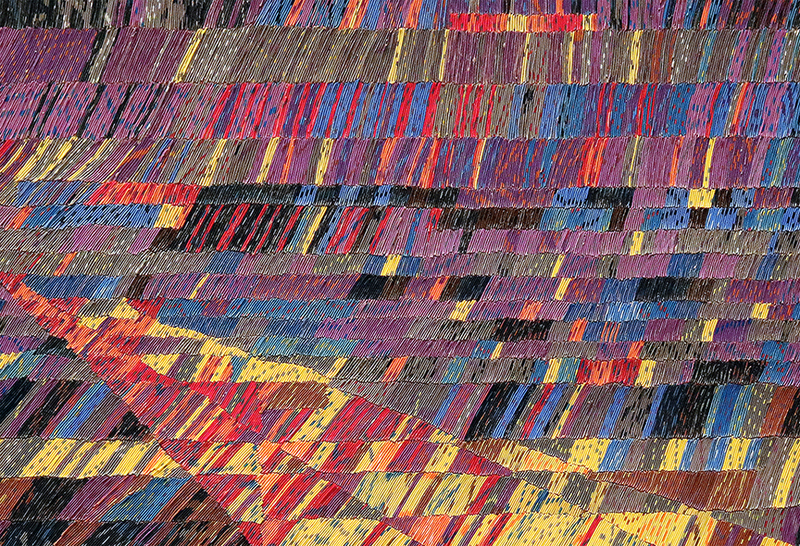 Hermant has meticulously repurposed this digital debris into a series of refracted and striated surfaces, whose clusters of individually colored wires map out and give dimension to shifting patterns of light and space. 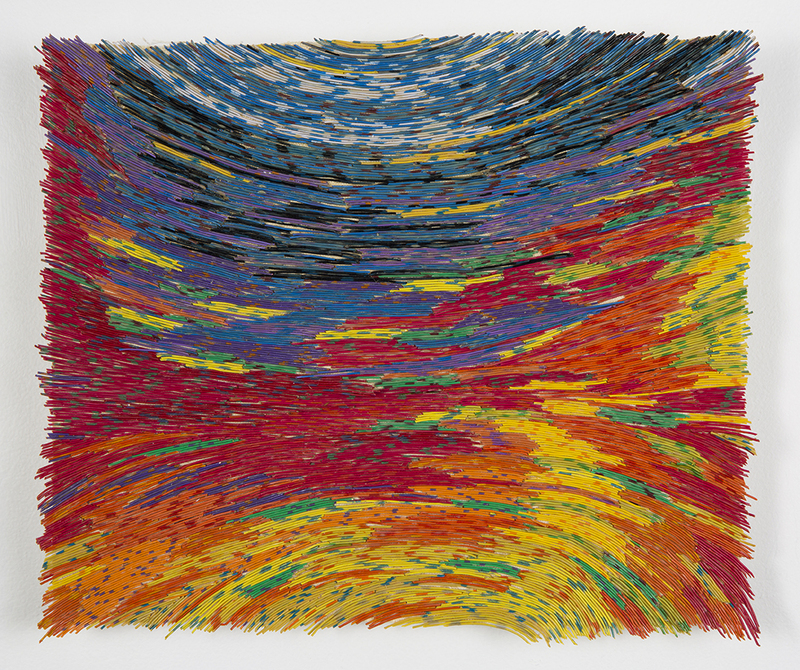 The exhibition’s title is taken from poet Stanley Kunitz’s “Halley’s Comet,” which touches on our notions of time, space, motion, childlike fear and wonder, and the textures and colors of transformation, love, and longing. Emily Hermant is an interdisciplinary artist whose large-scale works explore themes of communication, gender, labor, and the spatial experiences of the body. 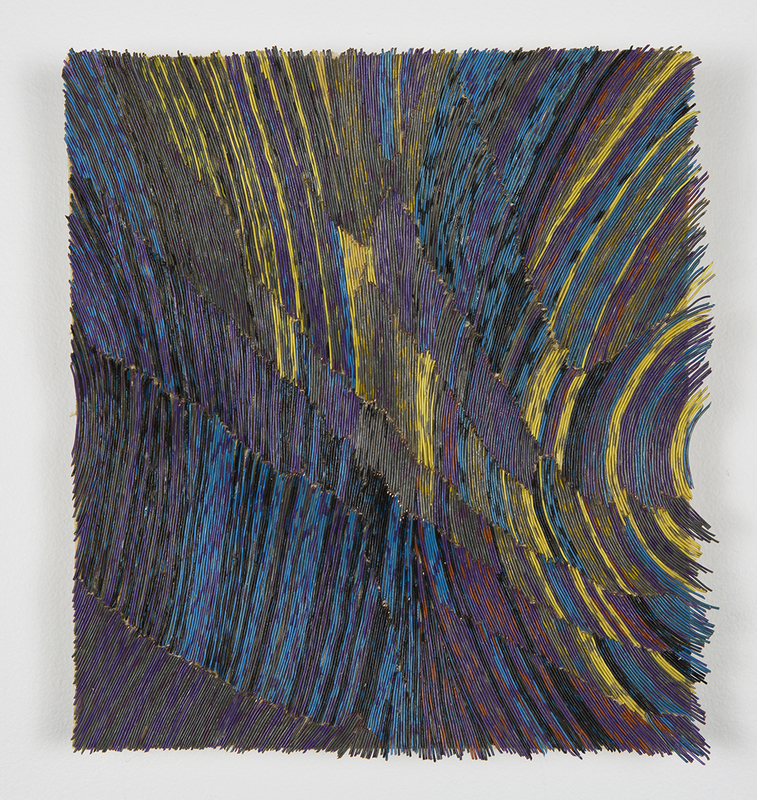 She received her BFA in Studio Arts from Concordia University, Montréal, Canada, and her MFA in Fiber & Material Studies from the School of the Art Institute of Chicago. 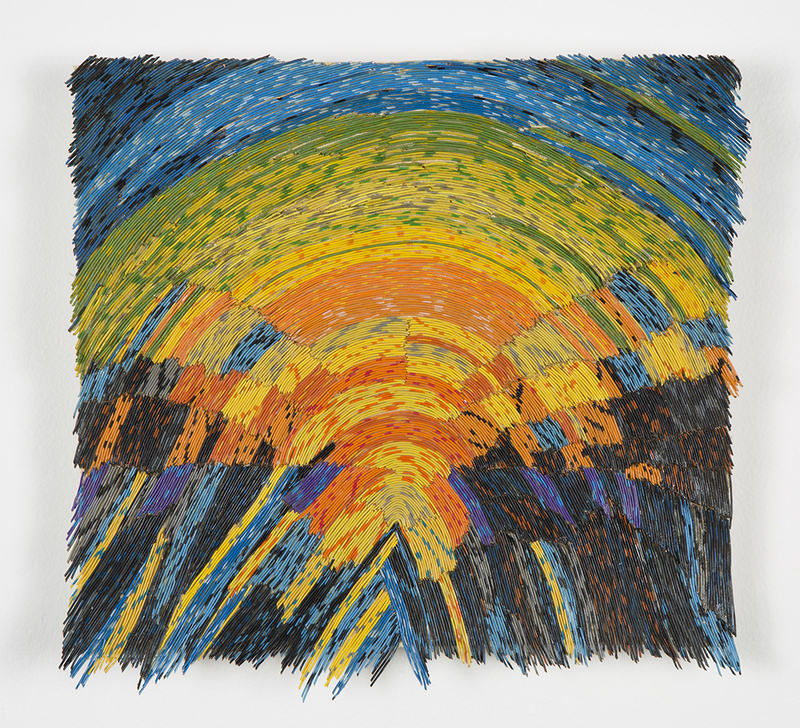 Her work has been exhibited nationally and internationally, including solo exhibitions for Terrain Exhibitions, Ace Art in Winnipeg, CIRCA Art Actuel in Montréal, The Delaware Center for the Contemporary Arts; and group exhibitions at The Ukrainian Institute of Modern Art in Chicago, Virginia Commonwealth University, Hyde Park Art Center, Triennale di Milano Museum in Italy, and the Museum of Arts & Design in New York. Her work has been featured in LVL3 Media, ArtSlant, Espace Sculpture, The Washington Post, and TimeOut Chicago. Hermant has been awarded grants from the Canada Council for the Arts and the Conseil des Arts et Lettres du Québec, as well as artist residencies at the Vermont Studio Center, ACRE, Ox-Bow School of Art, The Ragdale Foundation, and The Nordic Artists’ Centre in Norway. She has taught at the School of the Art Institute of Chicago, Virginia Commonwealth University, Concordia University in Montréal, and was formerly Assistant Professor and Head of Sculpture in the Newcomb Art Department at Tulane University in New Orleans. 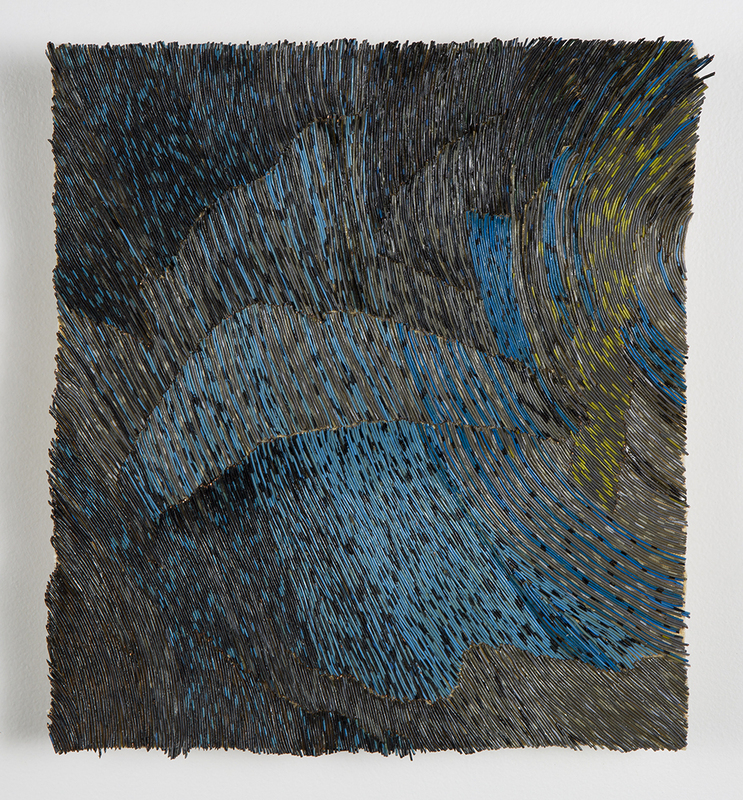 Hermant is currently based in Vancouver, Canada, where she is an Assistant Professor in the Audain Faculty of Visual Art and Material Practice at Emily Carr University of Art + Design. 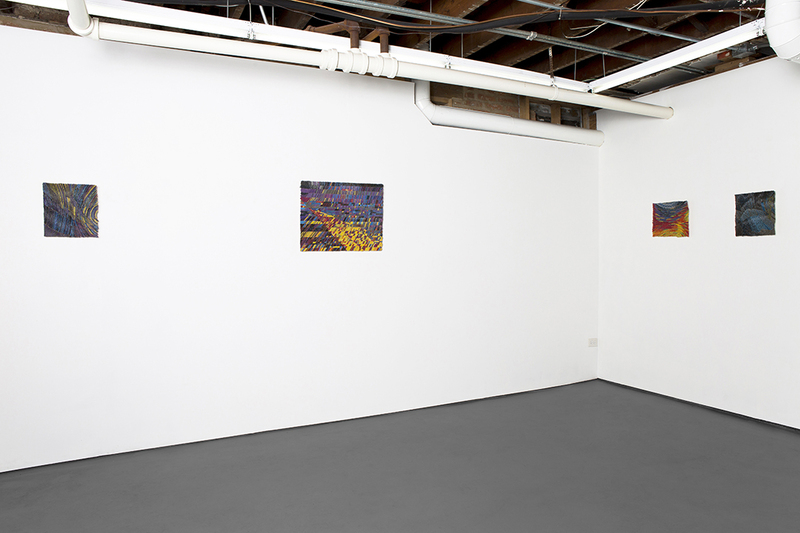 Reflections on Perseid (No.2), 2015, Collected and stripped telecommunications cables on canvas, Reflections on Geminid (No1), 2016, Collected and stripped telecommunications cables on canvas; Reflections on Leonid (No.1), 2016, Collected and stripped telecommunications cables on canvas; Reflections on Perseid (No.1), 2015, Collected and stripped telecommunications cables on canvas. Reflections on Perseid (No.1), 2015, Collected and stripped telecommunications cables on canvas. Reflections on Geminid (No1), 2016, Collected and stripped telecommunications cables on canvas. Reflections on Geminid (No.2), 2016, Collected and stripped telecommunications cables on canvas. Reflections on Leonid (No.1), 2016, Collected and stripped telecommunications cables on canvas. 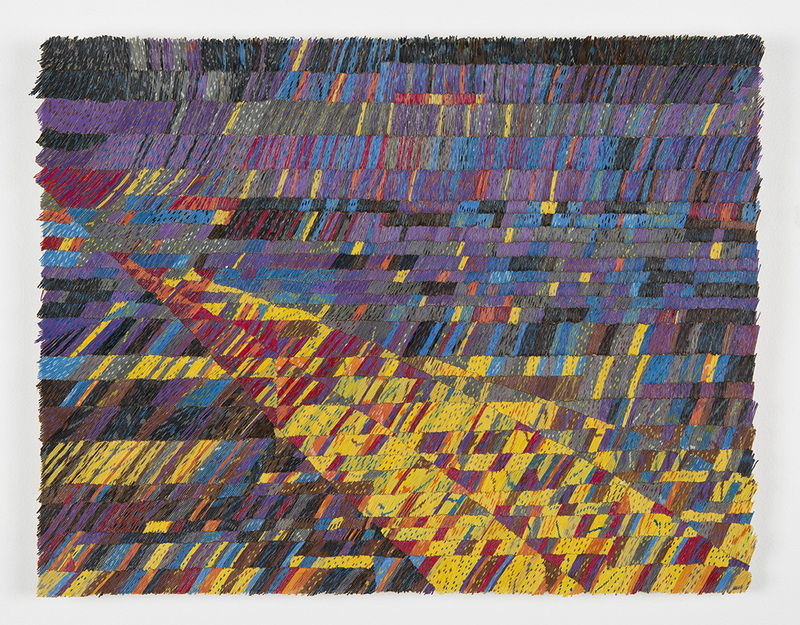 Horizon at Night (No.1), 2015, Collected and stripped telecommunications cables on canvas. 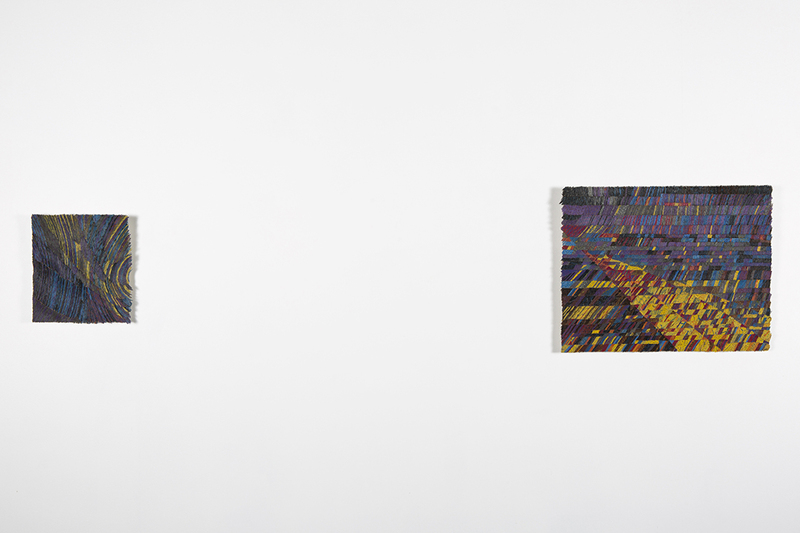 Reflections on Geminid (No.2), 2016, Collected and stripped telecommunications cables on canvas; Horizon at Night (No.1), 2015, Collected and stripped telecommunications cables on canvas. Reflections on Leonid (No.1), 2016, Collected and stripped telecommunications cables on canvas; Reflections on Perseid (No.1), 2015, Collected and stripped telecommunications cables on canvas. 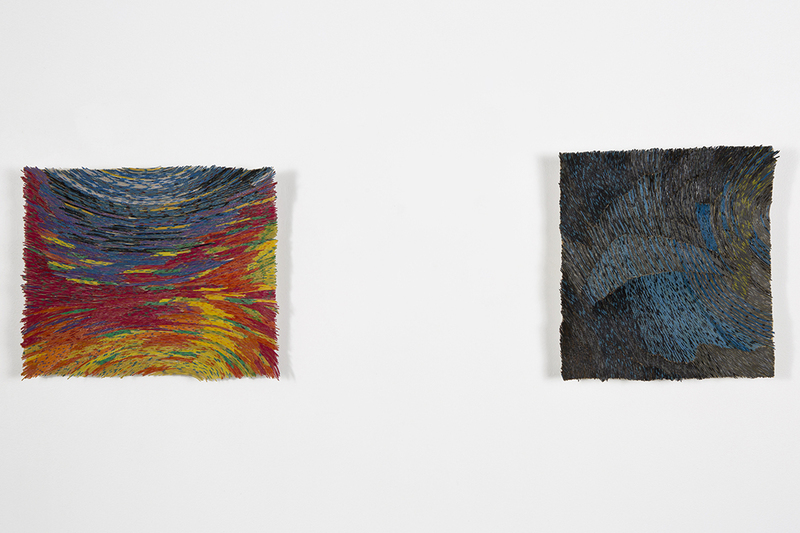 Reflections on Perseid (No.2), 2015, Collected and stripped telecommunications cables on canvas, Reflections on Geminid (No1), 2016, Collected and stripped telecommunications cables on canvas. 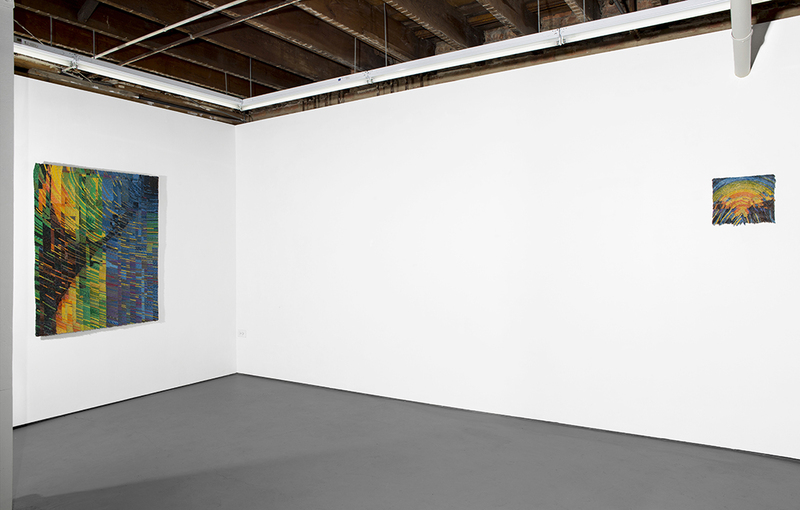 Reflections on Geminid (No1), 2016, Collected and stripped, telecommunications cables on canvas; Reflections on Leonid (No.1), 2016, Collected and stripped telecommunications cables on canvas; Reflections on Perseid (No.1), 2015, Collected and stripped telecommunications cables on canvas; Reflections on Geminid (No.2), 2016, Collected and stripped telecommunications cables on canvas.